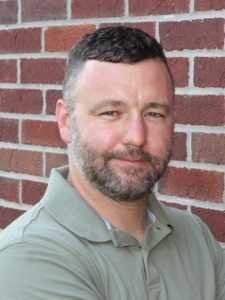 Bart Bettiga, Executive Director of the National Tile Contractors Association (NTCA), has been chosen to be the 2018 recipient of the NTCA Ring of Honor Award. The NTCA Ring of Honor Award is a lifetime achievement award that recognizes NTCA contractors and associate members whose efforts have helped grow the association and assisted in achieving its objectives. Recipients are chosen by NTCA executive officers. 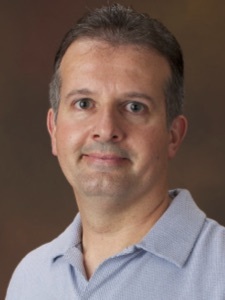 Bettiga has been NTCA’s Executive Director since 2002 and also serves as publisher of its publication, TileLetter. 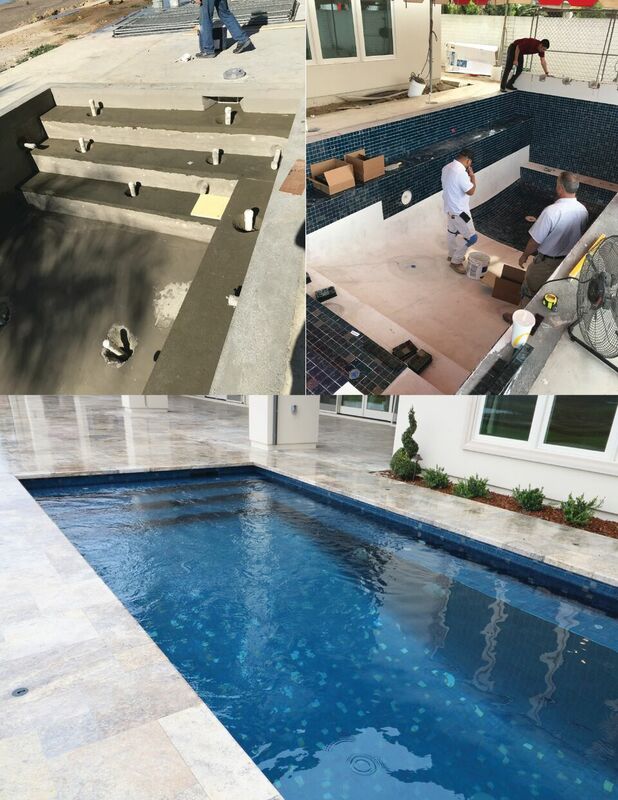 Having over 30 years of experience in the tile and stone industry, he is also a well-known speaker and author on the distribution and installation of ceramic tile and natural stone. During his tenure at the NTCA, the association has gained over 1,000 members. 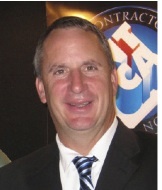 Bettiga will be the first active NTCA executive director to receive the honor in the award’s 14-year history. In 2007, the award was bestowed upon past NTCA executive director emeritus Joe Tarver. Tarver was executive director from 1972-2002 and the creator of NTCA Reference Manual and the NTCA workshops. Other past recipients include John Cox of Cox Tile, Scott Carothers of CTEF, Don Scott and Robert “Bob” Robertson of David Allen Company, and Harold Turk of Dal-Tile. “His inclusion in the Ring of Honor is an award showing that his peers have recognized how hard he has worked and there is nothing more honorable and prideful than what this award represents,” said Cox. Bettiga will receive the award on October 30, 2018 during the Industry Awards Gala at Total Solution Plus in Grapevine, Texas. Members are always asking me about training opportunities. Well, this month I wanted to promote regional training. At the start of the year, NTCA announced that it would offer regional day-long events in each of its 12 regions throughout 2018. As we close in on the midway point of the year, NTCA Training Director Mark Heinlein has been traveling the country training NTCA members on one of two topics. 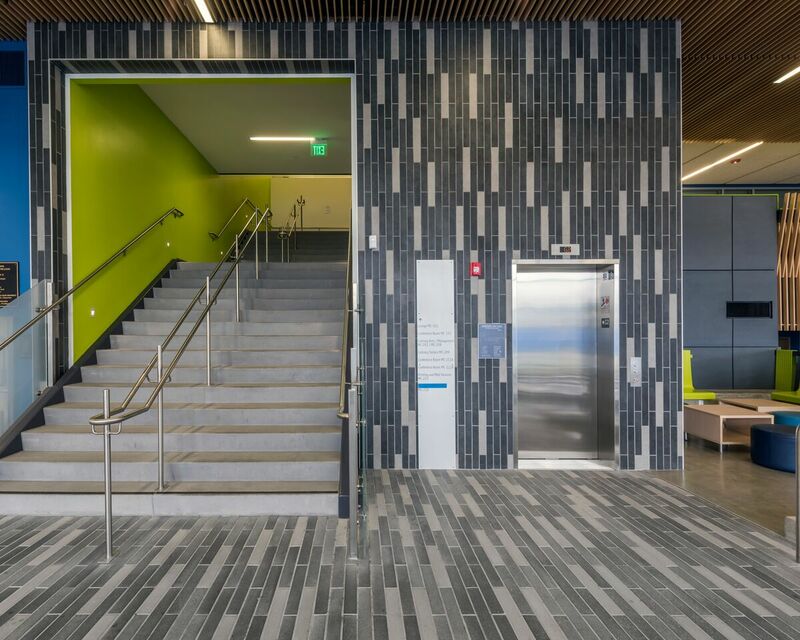 Depending on location, he could be leading a day-long training in Industry Standards/Substrate Prep/Large-Format Tile or Gauged Porcelain Tile/Panels. The Industry Standards/Surface Prep/Large-Format Tile session starts with classroom lessons on tile industry methods and standards using ANSI resources. From there, class members learn how to use and navigate the TCNA Handbook. The attendees spend the rest of the day in a physical, hands-on working setting. 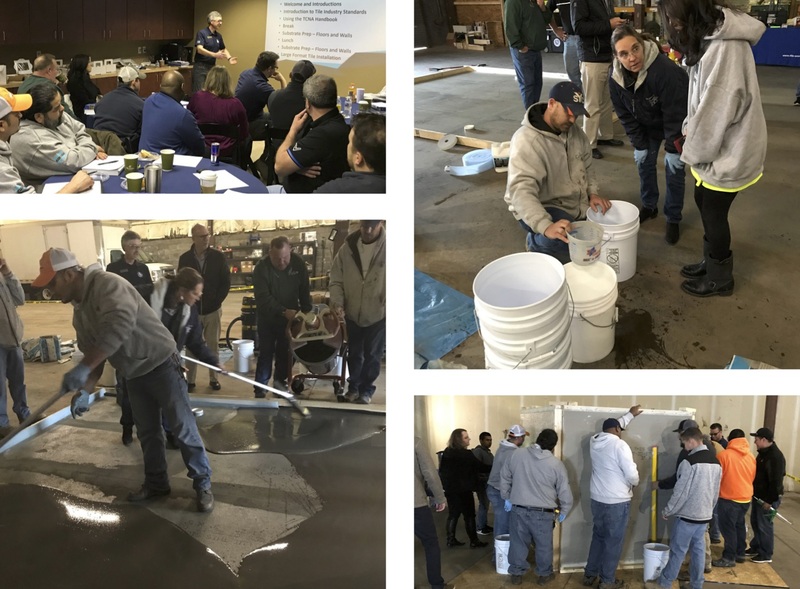 Heinlein works with the class to check substrate flatness on floors and walls, general examination of framing systems, and proper installation of cementitious backer units. He then reviews various surface prep methods before releasing the attendees to work with the prep materials. 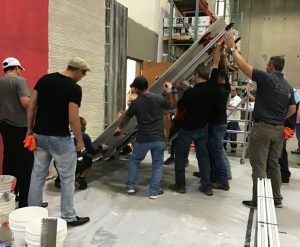 Attendees are teamed into small groups to explore proper materials and tools for patching and rendering a vertical substrate to meet industry tolerance for large-format tile. The small groups then experiment with and pour self-leveling underlayment (SLU). 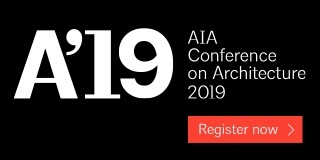 The Gauged Porcelain Tile/Panels (GPTP) course begins with streamlined overview of industry standards, then delves into ANSI A137.3 and ANSI A108.19, which have recently been approved and are specific to this new product. After the classroom work, attendees relocate to the work area to learn about the tools that they will use during the day. Every attendee will join a small team to set a full-sized panel on either on a floor or wall substrate. As the teams work through the process, Heinlein offers tips and tricks to lead to a successful installation. 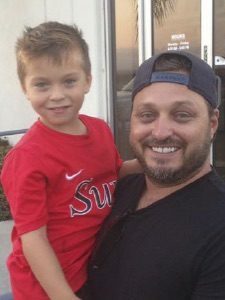 Rod Owen, Owner, C.C. 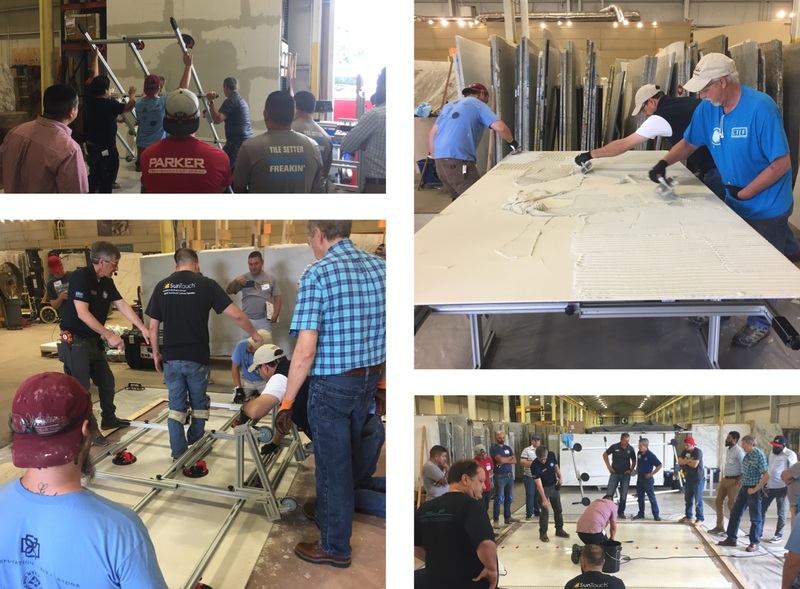 Owen Tile, stated: “We had the opportunity to send a diverse group of our men for the Gauged Porcelain Tile Panels training. They ranged from master journeymen to first-year students in our Apprentice Training Program here at C.C. 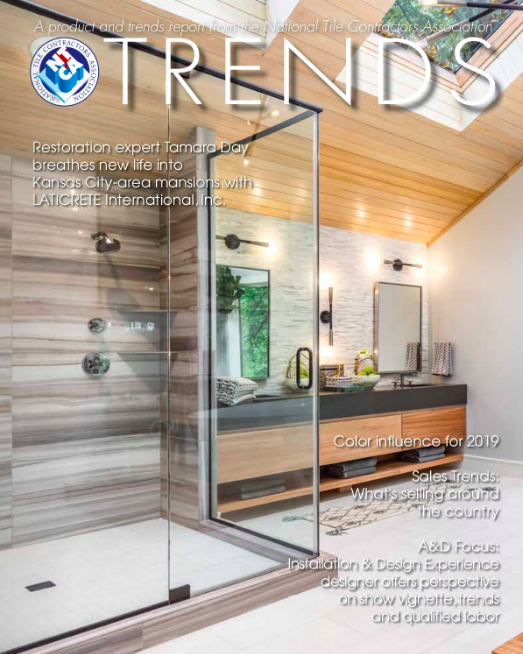 Owen Tile Co.
“The training gave the opportunity to discover new, exciting materials and methods of installation while emphasizing the absolute necessity for a strong core foundation of time proven methods,” Owen continued. 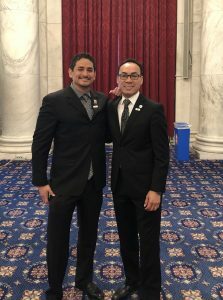 “While our veterans were realizing the importance of staying in the know of their ever-changing industry, the apprentices were digesting the many aspects of an industry they have just begun a career in. “It’s great to see these guys the several days after the training session because there is a synergy that comes from these sessions: the guys learning something new, and the guys realizing the company cares about their professional growth and development as well,” Owen said. 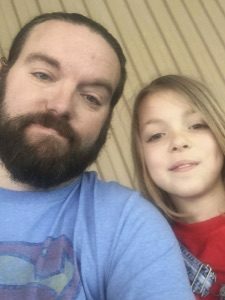 “It’s also intriguing when we tell the general contractor we are pulling guys off their jobsite for the day. 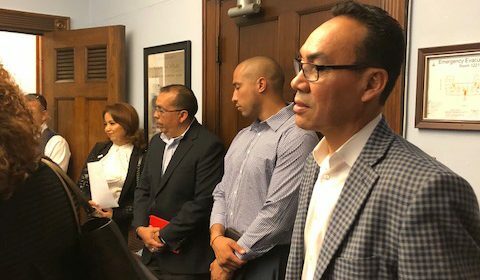 As a specialty contractor, logic would tell you that the GC will have a fit but to our disbelief most are in support when you tell them it’s a training session. Due to the magnitude of hands-on work and training by Heinlein, class sizes are limited to the first 20 registrants. 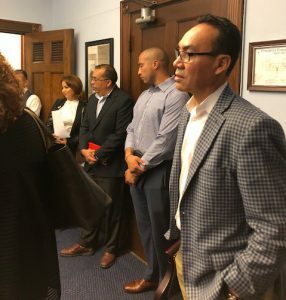 In many cases, we are also unable to accept attendees without a registration and don’t have room in the training area to allow people to just stay and watch. If you decide to register, no matter which training event you attend, you are going to learn something even if you think you are an expert already. The next regional training event is in Elk Grove, Ill., on July 13th. 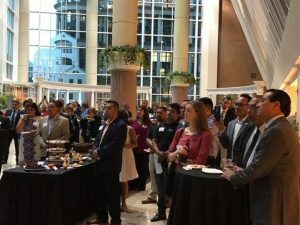 To learn more about regional events available in your area, visit https://bit.ly/2Lccbq6. 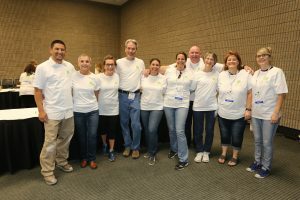 An industry outreach to the local community at Coverings 18 in Atlanta this year took the form of four teams of volunteers meeting Monday afternoon, May 7 in a friendly competition to assemble 800 kits of hygiene and toiletry products to be delivered to area homeless veterans. 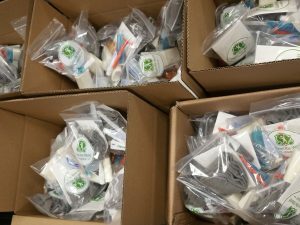 Four volunteer teams of 8-10 people each compiled 200 hygiene kits to be delivered to area homeless veterans by Clean the World. 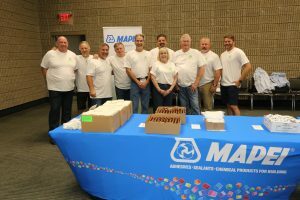 A 10-person team from NTCA, MAPEI, Florida Tile and industry press each enjoyed camaraderie and fun for a worthy cause as they put soap, shampoo, deodorant, toothbrushes, toothpaste combs, razors, socks, and a card with a personal message into a plastic bag that Clean the World Atlanta (https://cleantheworld.org) distributed to area homeless veterans. The Press Team (missing: Terri Sparks). 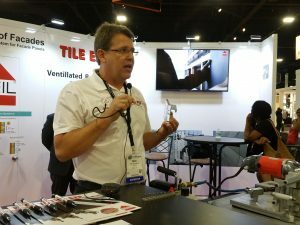 Florida Tile’s Ashley Donaldson and MAPEI’s Dan Marvin coordinated the overall effort, with Becky Serbin and Jim Olson overseeing the NTCA team, and TileLetter editor Lesley Goddin organizing the press team. 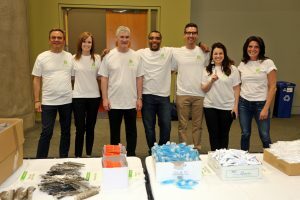 Each team assembled 200 kits in about 20 minutes, with the NTCA Team coming in first. 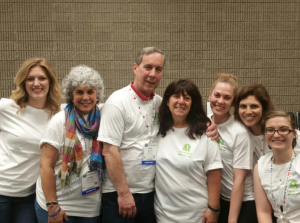 All members of this winning team received a gift certificate from show management company Taffy Event Strategies. 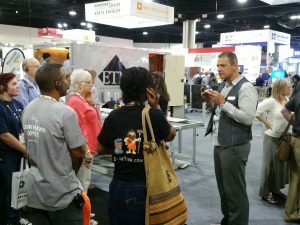 Contractors visiting Coverings ‘18 May 8-11 in Atlanta had the opportunity to partake in a full schedule of educational conference sessions, special features on the show floor like the Installation Experience, Installation Design Showcase, demos on the Installation Demonstration Stage, Quickfire sessions on a variety of topics and of course the amazing array of tile and stone products and setting materials, tools and associated products. 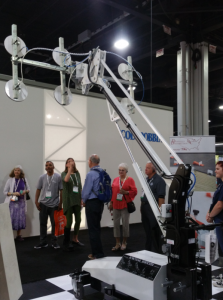 One great way to get a crash course of what’s available for contractors was to take part in a NTCA Tour, given Wednesday and Thursday of the show. 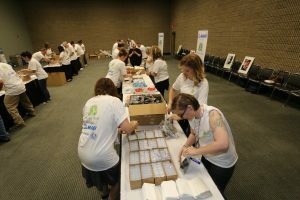 This tour, led by NTCA assistant executive director Jim Olson with assistance from member volunteers and Ally Jenkins from show management company Taffy Event Strategies, originated from the Contractor Lounge and led participants on a journey through 12 exhibitors in a little over an hour. 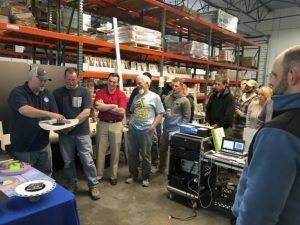 Raimondi/Donnelly Distribution : Lindsey Madrid introduced tour participants to the Italian-made RLS leveling system, Buzon pedestals and a range of cutters and blades. A new product is the Roboslab, a hydraulic-operated mobile lifter for gauged porcelain tile panels. European Tile Masters: Ben Szell showed a range of products and tables for handling, moving and working with gauged porcelain tile panels. European Tile Master’s (ETM) Ben Szell talked to the group about the company’s line of tables and handling devices for GPTP panels. USG: USG’s Leo Pena displayed USG’s Shower System featuring Durock with EdgeGuard. This improved edge protects again blowouts. 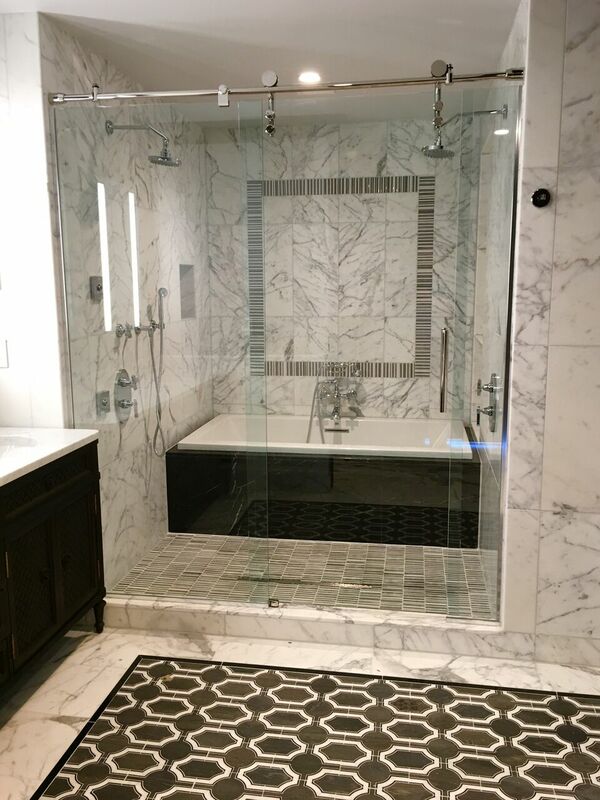 USG also offers the ability to custom configure a shower project, with materials easily sent to the site or contractor via UPS. 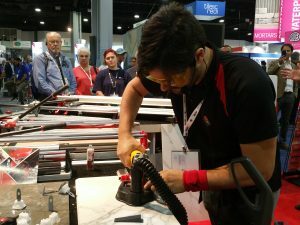 RUBI: Albert Mendez demonstrated the company’s TZ Cutter, as well as a vacuum attachment that eliminates dust from cutting tile and stone products. 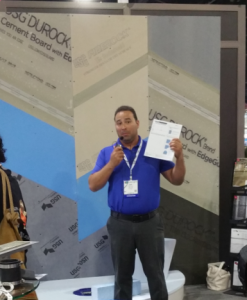 USG’s Leo Pena talks about USG’s custom shower program, standing in front of a display of Durock with EdgeGuard. At RUBI, Albert Mendez shows a vacuum tool that eliminates dust when cutting holes in tile or stone. 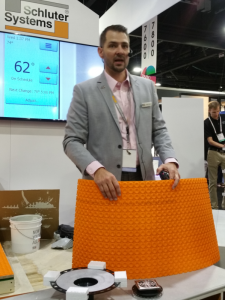 Schluter: Bobby Linam talked about DITRA-HEAT, which combines an uncoupling mat with a thermal break with customizable heating cables for electric heat installs. 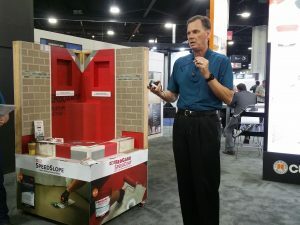 He also talked about the range of Schluter’s edge protection profiles, in metallic or textured powder coat styles, as well as movement joint products. MAPEI: Brian Pistulka talked about the company’s Planitop 330 Fast quick-setting, polymer-modified, fiber-reinforced, cementitious rendering, patching and leveling mortar for interior and exterior walls, floors and submerged areas as well as Mapeguard UM uncoupling membrane, Flexcolor 3D translucent, iridescent ready-to-use grout, and mortars that conform to ANSI 118.5 for gauged porcelain tile installations. Bobby Linam discussing DITRA-HEAT at Schluter. At MAPEI, Brian Pistulka tells the group about Planitop 330 Fast Patching and Rendering Mortar, Flexcolor 3D translucent and iridescent grout and other MAPEI products. 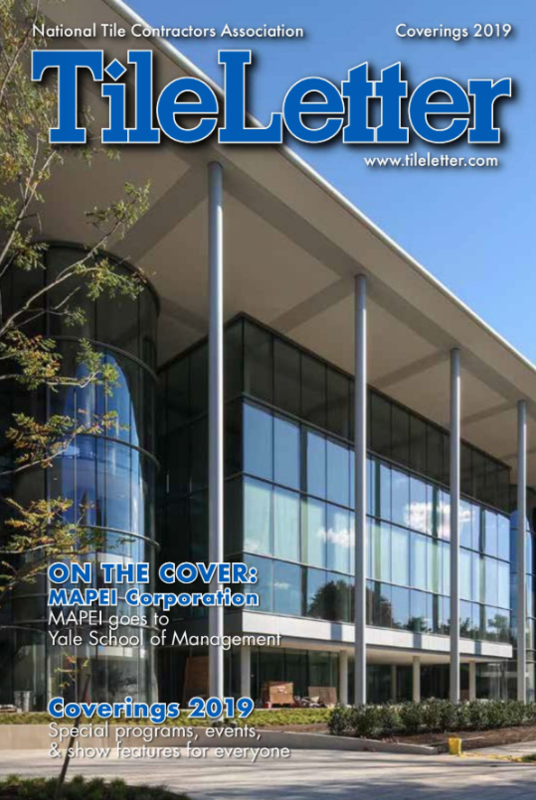 Tile Eze: Niels Mierendorff discussed the company’s Keil concealed anchoring system for ventilated facades which is proven in extreme weather conditions and offers a simple three-step process that allows for panels to be hung as easily as a picture. In addition, Tile Eze demonstrated its automatic grout cleanup machine, which cleans 1,000 sq.ft./hour residentially and 1,500 sq.ft./hour commercially. Lackmond: Justin Thomas demonstrated the Beast 10” saw and the Beast B-BTEC Rail Saw. Neils Mierendorff at Tile Eze presented information about the KEIL concealed anchoring system for ventilated facades. 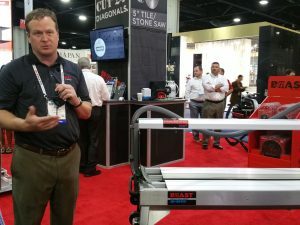 At Lackmond, Justin Thomas talked about the BEAST line of saws and cutters. 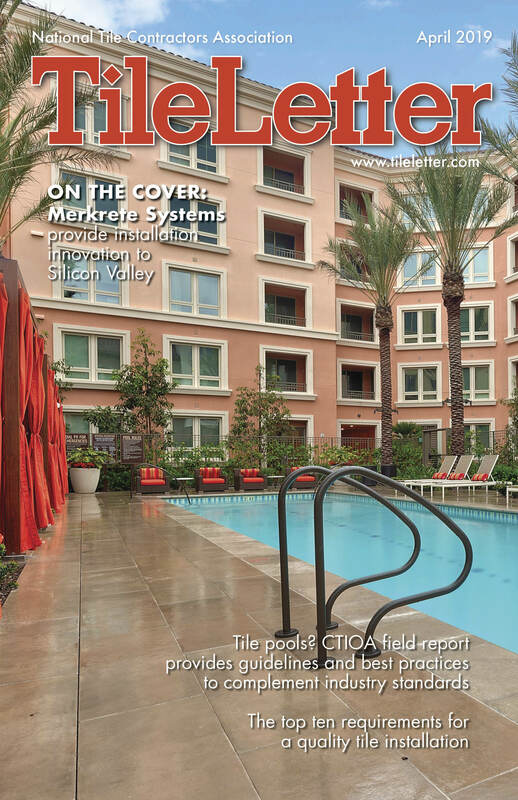 CUSTOM: Russell Brown discussed the benefits of SpeedSlope Rapid Setting Sloping Mortar and RedGard SpeedCoat for speeding waterproofing and tile setting in shower installations. 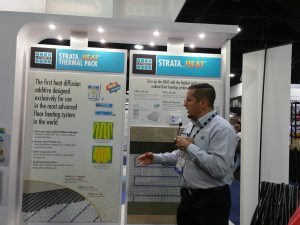 LATICRETE: Spencer Maheu conveyed the benefits of STRATA_HEAT Thermal Pack, which is the first heat diffusion additive designed exclusively for the STRATA_HEAT electric floor heating system. The STRATA_HEAT Thermal Pack eliminates cold spots between wires, reduces energy cost by 15%, and ensures heat from the STRATA_HEAT wire is distributed evenly throughout the adhesive. 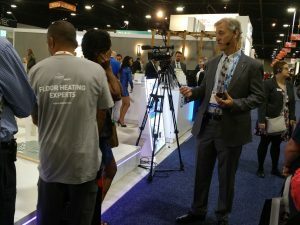 LATICRETE’s Spencer Maheu explaining the STRATA_HEAT Thermal Pack technology and the STRATA_HEAT radiant heating system. CUSTOM’s Russell Brown told contractors about the SpeedSlope Rapid Setting Mortar and RedGard SpeedCoat waterproofing for fast shower installations. TEC: Loren Doppelt told the group that with TEC’s Ultimate 6 Plus Mortar (TEC 487), projects can be grouted in as little as six hours. The product has a two-to-three hour pot life and 60 minute working time. 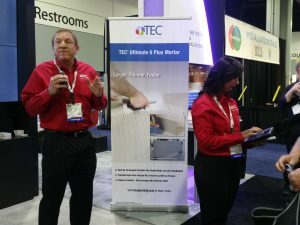 Loren Doppelt at TEC talked about Ultimate 6 Plus Mortar, for set to grout in six hours. Exhibitors handed out information, cards and giveaways, with contractors returning after the tour to discuss products individually with suppliers.